Whereas it was to Ruth whom Duke entrusted the administration of his Sacred Music and publishing company, Mercer was in charge of everything else. In 1987, he assigned me to create the full-length, concerto-grosso orchestration of his father’s magnum opus, Black, Brown and Beige (BBB) which was commissioned by G. Schirmer, Inc.
Because I only had personal contact with Mercer while I was briefly within the Duke Ellington Orchestra (1973), in his home in NYC (1987, ’88), at the Smithsonian Institution (1993) and at the Blue Note club, NY (1995), I cannot say that he was my mentor, as was Ruth. Ours was an experience that brought me into the Ellington Orchestra (1973) and that resulted in the Ellington-Horton BBB (1987-88; Please see “My Concerto Grosso Orchestration of Duke Ellington's 'Black, Brown and Beige”). I first met Mercer (1973) as he was departing the band bus at San Francisco’s Great American Music Hall. I was first in line waiting for the doors to open when the bus arrived. I approached Mercer, showed him photographs of my work and was mesmerized when he very graciously invited me to ride on the bus with the Ellington orchestra members to Sacramento the following night (Saturday, the night before Palm Sunday). On the bus ride back to San Francisco, after Duke had told me, in his dressing room, to call him at the Anaheim Hotel the following week, Mercer advised me to call him at 3:00 a.m. to be assured contact (I didn’t get much sleep that week! Duke kept telling me to call him “tomorrow”.). Finally, on Good Friday, Duke directed me to come to Disneyland from San Francisco to conduct my music with his orchestra, which happened the following evening. Mercer was in the trumpet section. That blessed experience was because of Mercer’s step-by-step advice (I remember that Toshiko Akioshi also played a great piano solo, on Take the "A" Train, during intermission at Duke’s invitation.). Once in the orchestra (after Disneyland), I cannot say that Mercer and I were on the very best of terms: respectful and cordial, but somewhat strained. The band traveled from California to Houston where we stayed at the Shamrock Hilton Hotel (and the motel across the street). The band then traveled to Dallas for a Sacred Concert at Lovers Lane United Methodist Church, where Duke gave me my job description as the composing and conducting assistant on his “team” (30 April 1973). Fourteen years passed before Mercer and I had contact again, this time resulting in the Duke Ellington-Randall Keith Horton Black, Brown and Beige orchestration. He had responded to a call from Daniel Kingman, conductor of Sacramento’s Camellia Symphony Orchestra. Dr. Kingman had read Gary Giddins’ “In Search of Black, Brown and Beige”. He contacted Mercer and G Schirmer. My long-time friend and mentor, Kirke Mechem, whose music is published by G. Schirmer, supported Kingman’s and Mercer’s suggestion that Schirmer commission me to create the orchestration of the full-length BBB. From that point on, Mercer was my friend and advocate. I remember that he introduced me to his young son, Paul, who was about 8 years old (1988). Paul grew to direct the Duke Ellington Orchestra (with Barry Lee Hall’s very able and gifted assistance). I have developed a friendly acquaintance with his daughter, Mercedes, and, by telephone only, came to a cordial correspondence with his wife, Lene. 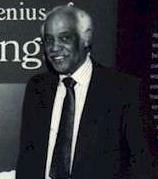 Mercer died in February 1996. I have regretted that I did not have greater contact with him. I am, however, greatly honored that he helped to bring me into the Duke Ellington Orchestra, and I will always appreciate him for the experiences that have resulted from that great blessing.